Starting out 2019 with a huge accomplishment for humanity! In the early hours of 2019, mission scientists from NASA and the Johns Hopkins University Applied Physics Laboratory waited on baited breath as the New Horizons satellite made it was back into communications with Earth. Being several billions of miles away, the signal takes roughly 6 hours to get back to the scientists for them to know it survived it’s flyby of Ultima Thule. At roughly, 10:30 am (East Coast Time) the signal telemetry started to link back up with Earth, proving it survived it dangerous flyby alone and will begin to upload its images over the next 20 months. The first of what we received is still slightly blurry, but proves that there is another world out there far away from our home planet and the New Horizons spacecraft continues to soar on its journey to find more out past our solar system. At left is a composite of two images taken by New Horizons’ high-resolution Long-Range Reconnaissance Imager (LORRI), which provides the best indication of Ultima Thule’s size and shape so far. Preliminary measurements of this Kuiper Belt object suggest it is approximately 20 miles long by 10 miles wide (32 kilometers by 16 kilometers). 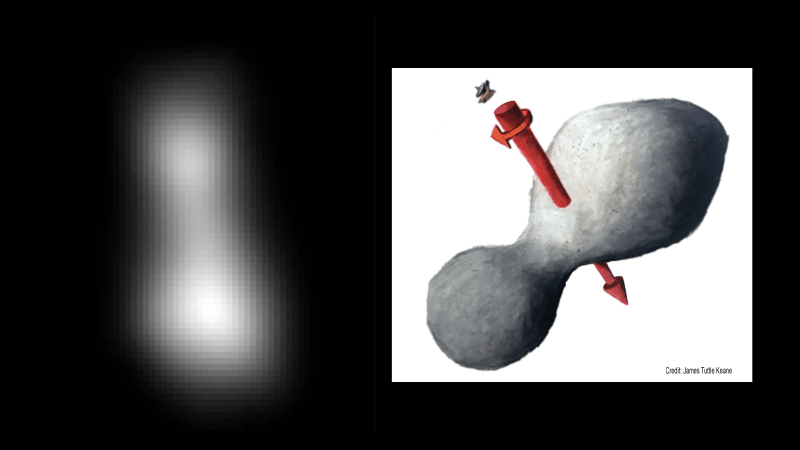 An artist’s impression at right illustrates one possible appearance of Ultima Thule, based on the actual image at left. The direction of Ultima’s spin axis is indicated by the arrows. Ultima Thule is so old and pristine that it’s essentially like going back in time to the beginning of our solar system.This flyby is the first exploration of a small Kuiper Belt object up close, and the most primitive world ever observed by a spacecraft. When the solar system formed 4.5 billion years ago, not all of the gas and dust surrounding the young sun became moons and planets. Some of the ancient debris remained in the form of KBOs and asteroids. But while asteroids are mostly rock, KBOs like Ultima Thule lie far enough from the sun that they held onto the bulk of their ice. The team anticipates an icy surface, probably covered with hydrocarbons. “We’re almost positive there will be organic material covering the surface, dark reddish material” states Project scientist Hal Weaver, of Johns Hopkins University. Next Next post: Is it OK to toss an apple core or banana peel outside?